Deciding on keeping a rooster or not, that is a big question! When it comes to keeping a rooster, there are pros and cons to consider. There are many people making money by keeping chickens and roosters as well. Your rooster will seek out food for the flock and alert the other backyard chickens that he’s found something tasty. As far as fertilization goes, keeping a rooster is necessary only if you want to hatch chicks or you want fertile eggs for the kitchen. Hens will lay nutritious eggs without a rooster. A virile rooster will mate frequently with most or all the hens in his presence. If there aren’t enough hens to divide his time, he may wear them out. This can cause damage to the hens’ combs, necks, and backs from the rooster’s beak and spurs. Generally, a good minimum ratio is 8-10 hens per rooster. Always watching over his backyard chickens, a vigilant rooster may appear to never rest. He’ll scan the sky and landscape for potential predators, warning the hens when he senses danger. While protection is a positive trait, some (but not all) roosters take it too far. If they become aggressive, they can injure adults and children by jumping or pecking at them. Keeping a rooster … He will check over food he finds before calling his girls to come and dine. Usually, he’ll stand back and let them get started before he begins to partake. On the other hand, he may fight for his share. Your rooster will love treats as well. Give him and your chickens some chicken scratch to keep them busy. Where do you live? Know that your rooster will make noise. While your hens may well go unnoticed; neighbors close to your home will absolutely know you have a rooster. Mate regularly with most or all of his hens, ensuring an ongoing supply of fertile eggs. Protect his hens by alerting them to aerial and ground predators. Call his hens when he’s found a food source. Want your chickens to have some fun? Roosters crow at the crack of dawn and all through the day. If you like this sound, it’s a good thing. A rooster will offer protection. A rooster just looks cool—and maybe colorful–strutting around the farm. You won’t want to consider getting a rooster if you want eggs for your table but do not want to hatch backyard chickens or eat fertile eggs. If you and/or your neighbors don’t like the sound of a rooster crowing all day long, do not get a rooster. If the noise won’t bother you, consider how close you live to your neighbors. Even if you are somewhat close, it may not be an issue. Consider where the chickens and rooster are on your property in relation to your neighbors. Consider also if the neighbors will only hear your rooster if they are outside. They may not hear him when they are indoors. If you really can’t decide if you should get a rooster and are okay with not ever getting a rooster, you can ask your closest neighbors if they would mind. However, before you do this, be very sure you will be listen if they say no. If you ever think you will want to get one, it’s best not to ask for their permission. Don’t get a rooster if your neighborhood, HOA covenants or municipal regulations prohibit roosters. If you have fewer than eight backyard chickens, do not consider getting a rooster. Consider special care the rooster will need. If you don’t want to remove the rooster’s spurs— a fairly simple procedure — from time to time, then don’t get one. 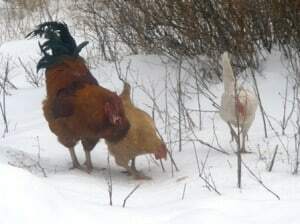 Backyard chickens will not be injured by a rooster’s spurs or beak during mating. You won’t have to worry about an overprotective rooster becoming aggressive, jumping or pecking at people. Among all breeds, there will be gentle roos and aggressive roos. But some breeds are known for more docile roosters than others. Generally, the more a cockerel is handled as a chick, the less likely he is to become an aggressive rooster. But even a docile roo will jump into action if he perceives a threat. Once cockerels reach maturity, it can be difficult to keep more than one male in the same small flock. One will claim dominance and will see the others as threats and competition. Sometimes this hierarchy is respected and no one is injured. More likely, there will be fights and injuries. The simple solution is to have only one rooster per backyard flock. At our farm we’re currently in between roosters. We’ve had three colored broiler roos, but they were all overprotective and so heavy they damaged the hens’ backs and necks while mating. Our grandchildren like to go in the chicken yard to cuddle young chicks and their favorite hens. We like walking among the backyard chickens without danger of a rooster jumping at our legs. We also appreciate knowing that our hens won’t be injured so often. Eventually, we’ll keep a colored broiler rooster for our broiler breeding program. But for our general chicken population, a gentler roo is in order. Since we’ve decided to focus on Buff Orpington hens for our layer flock, we’re going to try a couple of Buff Orp roos. They are known to be fairly docile—a good fit for our family. Owning a rooster is something to carefully consider. Factor in the amount of space you have, how many chickens you will keep, predators in your area, and noise. I have 3 roosters (2 too many) but they are all well-behaved, so I keep them around. Great post! I have on acccidental roo (I had ordered only pullets), and he is a nasty SOB. He’s a Golden-laced Polish. He is very handsome, though, I have to admit. Nancy, what breed(s) are your roos? We just got some Buff Orpington chicks and hopefully one will become a nice sweet roo. i have a silkie rooster presently…he is a sweetheart. I have previously had a rhode island red(the hen was the aggressive one..she was terrible..the roo…sweet),polish..sweet,domicker(sp)sweet,turken-banty..sweet,showgirl…sweet. I have never had a mean rooster…not sure why all mine are sweet…my friend has had terrible luck with roosters..most of hers have started out handled and turned mean later on…guess i have been lucky! AND mine start crowing around 2 a.m. and then off and on during the day til roost…but i live in the country and it doesnt bother us or my one close neighbor!! i lovethem!! Thanks for sharing on the Farmgirl Friday Blog HOp! I had badly wanted a rooster for awhile. Last year when some fertile eggs we had been given hatched and provided a couple of roo’s I was planning on keeping one. It went well until the crowing began, he started at 4am and went all day. It woke us up and made me worry about the neighbors. We are in suburbia and our coop is quite close to the house, one day when I have a bigger property and a coop that is A LONG WAY from the house well get a rooster again. When we first started with chickens we bought 3 barred rock hens that were 9 weeks old all 3 were roosters, we eventually found homes for them all. Our next 9 we got as 2 week old chicks 6 were roosters we re-homed 4 and kept 2 but we did break up a few nasty (bloody) fights before we found the 4 new homes. Currently we have an Ameraucana rooster and a Black Copper Maran rooster. There are definitely pros and cons, but I like having them around. Would love to see him…do you have a photo? Beth, we will call you the Rooster Whisperer–you must have a golden touch! Do you handle them often? Debbie, some of those roos do get very handsome, don’t they? Love the feathers that look iridescent in the sun. Thanks for including us at Farmgirl Friday! Cheryl–Kind of defies the 50/50 pullet to cockerel chick theory, doesn’t it? I think BCM are just about my favorite roosters to look at…though I’ve never had one! Just wanted to say that this post is AWESOME, and I’ll be featuring it as my pick in tomorrow’s Barn Hop. Great job! Thanks Jill! Seems like roosters get mixed reviews–personally I love the crowing and the aerial predator warnings, but not the suspicious rooster staredown! We just dispatched our 4 surplus roosters, and we’re back to just the one beautiful Australorp. He has 6 girls to look after, and does a great job. We’re hoping to breed from them this spring (i.e. soon – we’re in Australia so spring is just around the corner!). Darren, it’s always nice to hear about a good roo! We have a batch of Buff Orps growing out with five cockerels among them. We’ll be selecting two to be our new resident roosters. I like your website–just signed up for your news feed. Great to hear from you! I have found the disadvantagge to having no rooster is that one or more hens will develope the male characteristics including covering the hens and eventually growing larger combs and crowing if not stopped before loss of egg production. Had a friend whose Buff Orpington did the same thing. Now have a Bantum rooster who takes care of the girls and is not aggressive toward humans. We have heard that before, Elizabeth. Sounds like a banty rooster is a good option! We have a Rhode Island Red rooster, who is the last of our first birds, and he just doesn’t like anyone. He is very aggressive, and, while he does his job, he really does his job far too well. We seem to usually have about two roosters in our flock, though it sounds like we may have a third coming from our chicks, and he is always on top. One of our other roosters is a purebred Ameraucana, the true breed, not the easter egger, and he is such a sweetheart. He comes up to me and begs me for food, and almost seems afraid of his hens. I got him when he was 14 weeks old, and, even though he didn’t know who I was, he automatically decided I was his caretaker/mommy, and, while he runs from the hens, he runs right up to me. When I first saw this activity, I thought my little Vasska was crazy, but now, I’m realizing what a blessing he has been, for he really is a sweetheart. The third rooster, if he is in fact a boy, is a Barred Rock Ameraucana or a Barred Rock Easter Egger cross (we had both types of hens when the eggs were laid) and he was born with a Barred Rock body, but a brown forehead. As he’s grown, he has gotten his barring, and his brown head is beginning to look more and more like a barred rock every day, the brown is slowly becoming black and white,and he is beginning to look so much like his half-sister, a true barred rock. Personally,I like having at least one rooster around, partially from the look, and partially from the protection. It can be frustrating, if something attacks the coop at night (we’ve had a wide variety, though the weasel was the worst) and takes only the healthy hens, leaving you with a rooster who’s missing his full flock, or two roosters who don’t have enough hens between them, causing them to fight. . . I have a blue silkie rooster and a lavender pekin, both are kept separate with their own flock of hens. Pekin is friendly. Silkie is ok but overprotective and very noisy. Anyway my pekin hen hatched two beautiful chicks yesterday and was still in the same run as the rooster, checking upon them last night noticed the rooster had badly hurt one chick. And it was bleeding from his head. Removed mum and chicks to a safe place and he seems to be fine. Quite a shock though as didn’t think roosters did this?? I bought 8 hens 4 years ago and one was a rooster. We kept him and i was excited to have a rooster. Aparently Rhode island reds are aggressive, I have plenty of scars on my legs. All but the rooster were taken by coyotes…even the coyote knows to stay away from him. We just bought more hens and they are know 3 months old and different breeds. I heard on crowing, now I don’t know what to do. Am I going to have bloody rooster fights? Should I get rid of the rhode island red? the other rooster is a speckled sussex. What do I do? LaRetta–We have too many roosters this year too! How to deal with it depends on your facilities. If multiple roosters are in with a group of hens/pullets or able to see them, the boys will fight and it can lead to injury or death. Some people keep their roosters in a “bachelor pad” out of sight of the hens, and the boys seem to coexist fine. Then you can take a rooster to visit the hens when you want fertile eggs. Otherwise, it’s best to keep one rooster per coop or pen and allow only one rooster to free range at a time. Personally we have two coops with enough winter space for 10 chickens each, so we keep one roo and 9 hens in each one. The roos will still jump at each other through the fence, but they can’t injure each other unless they fly out. Clipping one wing will usually prevent this if your fence is high enough. As far as your situation, first make sure the crowing one really is a male. Sometimes hens will also make crowing sounds. I’d compare this one’s comb, wattle, and tail feathers to the pullets of the same breed. Usually a 3-month-old cockerel will have redder, larger comb and wattle and longer tail feathers. They often also stand taller and look leggier. If you can keep only one roo, you could choose whether you want a RIR or a Sussex. Or, consider that the RIR roo is already 4 years old and you might want to replace him with the young Sussex. If you have time to handle the young roo often, he may (or may not) end up less aggressive than the RIR. Be ready to cull one rooster at any time if you witness a bad fight or see injuries. In any case, if you do not want to use the extra one for meat (the RIR would be a stewing bird at this age), there may be someone in your community who would like a roo for their flock! Over a month ago I believe someone abandoned a rooster on the unoccupied lot next to my home (there are no other residential homes on my block.) After a couple of days of unsuccessfully attempts to capture the rooster I was finally able to have it follow me onto my property this morning with some chicken feed. I gave the rooster some chicken feed, lettuce and water. Never having a rooster or hens before I was looking for information on what I should provide it for shelter (live in South Texas) and amount of food. Thank you. Sounds like you have a new friend! Chickens need protection from predators and shelter from sun, wind, and rain/snow. Chances are he did all right hiding out in bushes or other vegetation on the vacant lot. A chicken shelter can be very simple, and people use all sorts of structures including children’s playhouses, pickup truck canopies, shipping crates, and storage sheds. Most chickens like to roost on something off the ground at night, and that can be a tree branch or a piece of lumber attached across the structure. As for food, I believe one rooster would probably eat around 6 oz. of feed per day. He’ll need access to fresh water as well. I can recommend two blogs to visit for lots of information about raising chickens: The Chicken Chick and Fresh Eggs Daily. Enjoy your roo! Thank you for the help and the quick response! I have 3 silkie hens and 2 rooster hatched from eggs. They are generally a happy family and only on rare occasions do the roosters have a go at each other. The are now 16 months old. One rooster can be over protective and flies at anyone. I have found that if I carry my broom about with me and occasionally pretend that I am sweeping, he doesn’t attempt to attack me – the broom is in charge. (I have never, and wouldn’t ever hit them with it) I admire the roosters for the protection that they provide and they too are very handsome. I have 3 cats and a couple of visiting cats and they chickens and poultry all get on fine. My only concern is the lack of hens to roosters. I worry that I should separate the girls from the boys for a few days a week, I really don’t know if this would be the right thing to do. Any views? They are pets and well cared for. If they are living peacefully, most likely the two roos have worked out their hierarchy. The one that is overprotective would be the dominant rooster. I would be concerned about three hens with even one rooster, as overmating can be hard on hens. The recommended ratio is a minimum of eight hens per rooster. Multiple roosters living with hens usually fight from time to time if not regularly. 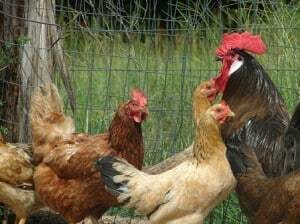 Multiple roosters can live peacefully if they can’t see any hens. If you can separate the hens from the roosters I would recommend it. If you want fertile eggs, you can put one rooster in with the hens for several hours. Thank you very much for your reply. I am in a difficult situation as I don’t have a lot of space to completely separate them out of sight of each other. I have put the hens in a caged area to peck around without being annoyed by the roosters and the roosters stay close by the cage hardly moving away although they have the freedom of the rest of the garden. When they returned to the coop in the evening one rooster wouldn’t allow a hen in and I had to put her in the back door before I allowed him in. I know that I can’t rehome a rooster as it would more than likely be a death sentence for him and I don’t want that. We had 3, 2 day old chicks. They all turned out to be roos, 2 derbyshire redcaps and a barred rock. 1 of the redcaps has a new home but the other 2 still live with me and a redcap female and a barred rock female. They are 6 months old and get along fine but my neighbours keep complaining about my barred rock’s crowing even though he doesn”t start until about 7.30am and we live on a main road. It breaks my heart to think I might have to find my boys new homes. I am extremely fortunate that my neighbours are supportive despite the cockerels crowing throughout the day-usually if there is a cat or a human around as they are quiet if left alone. I don’t open the coop until a bit later at weekends but make sure that they have food and water inside the coop, they seem happy with this arrangement and it keeps the place quiet and allows people their well deserved long lie. I hate the fact that people will kill a rooster with no conscience. I feel that their lives are as valuable as our own. My son hatched ours from eggs so I take full responsibility to ensure that they live happy, long lives, and it isn’t the easy option. we have approx. 60+ roosters of all breeds, ages and sizes. They live, loose, on a 60 acre horse rescue facility. We do not have any hens and we do not accept any Game Fowl breeds. We do not have hens because most hens get adopted as soon as we get them and obviously it would not be safe for a hen with this many boys around! We do not accept any Game Fowl Breeds because I have found that they just will not stop fighting. A Game Bird will just keep fighting (while the ‘home boys’ just stop when they get tired, and another takes its place (sorta like a Roo Tag Team!) ) The Game Birds do what they were bred for… fight and eventually they just get exhausted and literally fight to their death. So… no game birds here. But the other Roosters will actually develop they own Bachelor Groups and live peacefully. They roam the hay barns. horse barns and generally everywhere in these groups. There is hardly ever any fights and when they do occur, they only last a few moments and never any injury’s. With 60 acres and multiple open barns/ area’s there is very little chance of any rooster getting cornered by a gang of other roosters. I have noticed the roosters will group up with others of like size or same size and or similar colors. and we don’t have a rooster crowing now and again… we have CROWING WARS!! We are getting in a large group of Broiler cross roosters today. They are only about 14 weeks old… I really hope, being free range these boys stay sound and their legs don’t ‘break down’ like regular broilers do. anyone have any idea as to the life expectancy for a PET..Colored Broiler rooster is? we are the only rescue who accepts roosters that I know of. we have had people bring us their roosters from as far away as 300 miles! we do adopt some out but for pets only. I have a mixed breed silkie roo and he has been with my girls since the summer past hes been doing his job well even telling my one hen to lay in the nesting box i was really starting to like him until today he started fighting with my alpha hen to the point where they were both bleeding i have separated them but now im wondering if i should give him a second chance or dont risk it and find him a new home ? You really are a gem. They are such great birds and so protective of their families. Many people could learn from them. I love our two and they really seem to get on pretty well and although I only have three hens, the hens don’t want to be away from their roosters. They seem to have sorted things out for themselves. Even the cats mingle happily with them and I am pretty sure Boris – my male cat looks upon them a “his”, Pecky sometime chases people but Coops (Rooster no.2)tells him off for doing this and I have found that carrying my broom around stops Pecky bothering me, I am not sure why. Keep up your fantastic work you are a breath of fresh air. Please give him a chance – even the best of us have a bad day. I have noticed that hens can be as nasty to each other as cockerels. Yes, we have a tough rooster as well. Everyone is very afraid of him. Especially the neighborhood kids. I work at a farm with a nasty rooster. The owners will not get rid of him. How can I keep him from attacking me? I try to avoid him but now that the weather’s cooler he’s always around. Help! I hand raised a buff orpington/rhode island chick after his momma was killed. He loved to be petted and jumped on people’s laps for attention. Though he sometimes had an ulterior motive: food. Picnics outside were a rare treat for my orange rooster. My guests thought he was sweet and adorable when he jumped on their laps- until he stole their sandwich and dragged it across the yard. Though he eventually grew up and busied himself with the hens he was finally old enough to care about and bickering with the other roosters on the property, he still squeezed in some time to kamikaze the picnic table, and run off with something. Worse; he trained MANY of my hens in the art of thievery. Yelling “NO!” and “Bad Chicken!” was not at all helpful, in case you were curious. Despite not being able to eat outside, he was my favorite rooster. He was very friendly and very mellow, protective, without being aggressive. Even towards the other roosters, he showed them their place in the pecking order, and little more then a dirty look was enough to keep them in line.